Hiring a moving company can be overwhelming. You want to make sure that you are hiring a reliable company that you can trust. 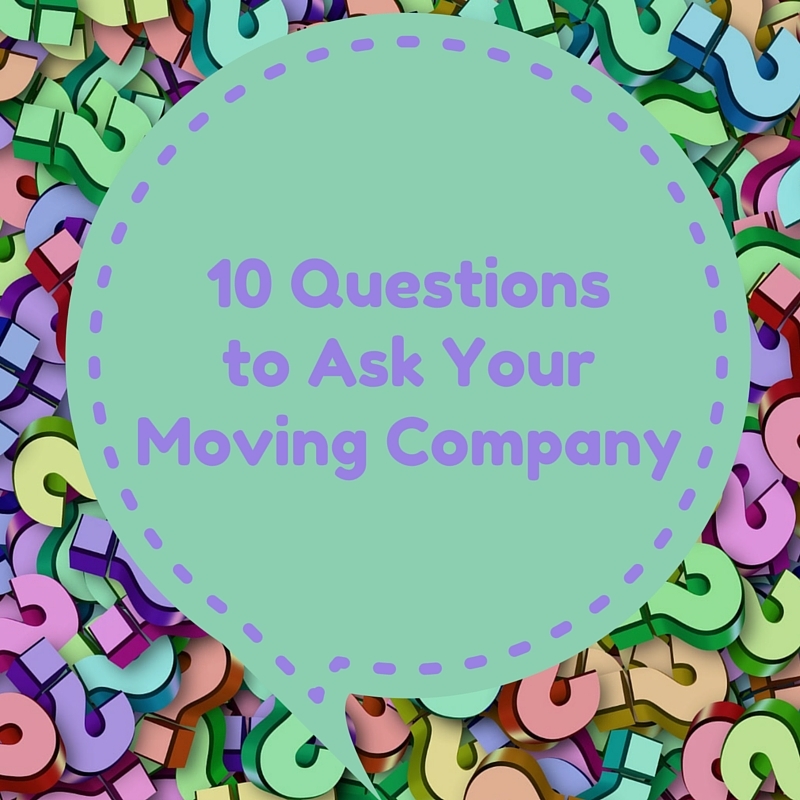 To help lessen your stress, here are 10 questions to ask your moving company. Then, you can pick the best company for you and know your items will be safe. Usually, if a company has been around for a while, it’s a good sign. It's an indicator that people have trusted and recommended them so much so that they can continue to be in business. However, if the company is new, that doesn’t mean they’re bad--every company started from somewhere. The best bet is to look at reviews and see who looks the best in your opinion. 2. What kind of liability coverage do you provide? You care about your items and you'd be upset if something happened to them. That’s why you want to check what kind of coverage a moving company offers. Most moving companies cover 60 cents per pounds per item. You can upgrade to full value protection or choose to have your valuables insured based on their cost and not weight. This will give you peace of mind that even if an item does get damaged, you will be covered. 3. How will my special items be handled? Ask how the company deals with special items--such as experience and special packing and handling procedures. This will also give you the opportunity to tell your movers how you want your items protected. 4. Can you give me any references? The best way to get an honest opinion about a company is to read reviews and check references. You can check for reviews on a variety of websites. The moving company should be able to tell you where you can find reviews. Be wary if all the reviews are positive with five stars--they could be fake. Look at other review websites to get a good idea about the company. Most moving companies accept most major credit cards, money orders, bank checks, or PayPal. However, it’s best to ask and see if they accept the payment that you’re most comfortable with. 6. Do you do in-home estimates? You want to make sure your movers give you as accurate a quote as possible. If they do in-home estimates, they will be able to see exactly what you need moved and give you an accurate estimate. 7. Are there any extras fees? Sometimes moving companies charge extra for the number of stairs in your home, fuel or tolls. Make sure to ask about the possibility of additional charges before booking your mover. 8. Does your quote include packing? If you plan on packing the items yourself, make sure in your quote that you aren’t being charged for packing services. Even if you want the moving company to pack the items for you, make sure that there won’t be a surprise charge later on. 9. Is your company a member of the Better Business Bureau (BBB)? The businesses that are part of BBB are usually ethical and trustworthy because there are high standards that need to be met to be a part of the organization. If you hire a company that is a member of BBB you will feel safe knowing that you can trust them. 10. What other paperwork will I need? Your moving company should provide you with four documents. Written estimate. Your estimate written on paper. Order for service. Which is a document that has all the services the movers will perform. Bill of landing. It’s the contract between you and mover and a receipt of your belongings. Inventory list. It’s a list of each item being moved and its condition. If they don’t, make sure to ask. You’ll want everything in print so you can make sure your items are safe and you’re not getting ripped off.